Digitally Imported has been a long standing digital music radio station and now you can listen to DI on your iPhone or iPod touch with the Digitally Imported Radio iPhone app. 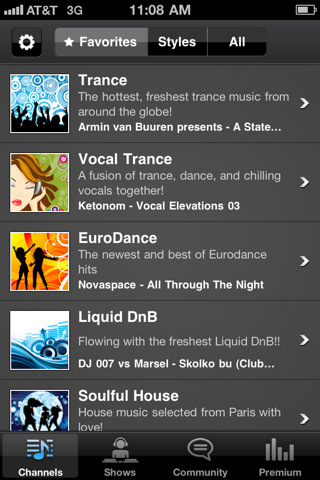 The app has 37 streaming channels ranging in everything from Techno to Trance, Ambient, Dubstep and House to name a few. If you’re a premium subscriber you can login and get higher quality audio without ads or banners. The radio stations are listed in the Channels tab and they can be sorted and viewed in a variety of ways. The styles are: New, Trance, Dance, House, Lounge, Chillout, Techno, Beats, Ambient, Vocal, High BPM, Hard, and Classic. Favorites functionality lets you get to your personal favorites. In the DI Radio app there is also a list of upcoming Shows that you can connect with and listen to. While a station is playing you see the track name and a track history that shows the past 3 songs. The track info is not linked to anything. The player displays your bitrate and listening time. There is also a buffer measure bar that adjusts as the strength of your connection changes. The big problem with the Digitally Imported Radio app on the iPhone are the connection issues it has. The music stops playing randomly while the player tries to re-buffer the stream. This is not just a rare occurance either, it happens quite often, sometimes every few seconds. And this is over WiFi, not 3G, so you can imagine how much worse this issue can become if you’re over 3G. For me personally I finally had enough of the buffer issues and deleted the app. It might work better or worse for others, and the app is free so give it a try for yourself and find out. AppSafari review of Digitally Imported Radio was written by Joe Seifi on February 14th, 2011 and categorized under App Store, Free, Music, Radio. Page viewed 5309 times, 1 so far today. Need help on using these apps? Please read the Help Page.